Hotel Healdsburg (707) 431-2800 Located on the edge of the historic town plaza in the Sonoma wine country, this luxurious hotel and spa serves up all the swanky amenities you could possibly imagine. Duchamp Hotel (707) 431-1300 Suave and sophisticated. Six private, contemporary villas surround a pool and garden…need I say more. Boon Hotel and Spa (707) 869-2721 A hip boutique hotel just minutes from the Russian River. Simple, private guest houses with breathtaking views of the Russian River and North Pacific Coast. Jenner Vacation Rentals: (707) 865-9905. 10439 Hwy One, Jenner Ca 95450. 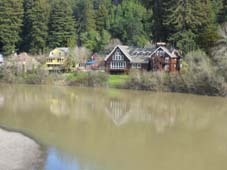 Choose from many riverfront bungalows and hillside retreats overlooking the Russian River and the Pacific ocean. The Honor Mansion (800) 554-4667, Healdsburg. Perks include: Egyptian cotton towels, feather beds, spa or soaking tub, fireplace. best not to show up soaking wet and in full river gear. Madrona Manor: (800) 258-4003, Healdsburg. Travel and Leisure magazine named this Victorian Inn a top 100 Worldwide Hotel. Manor perks: romantic and historic inn, acclaimed Zagat rated restaurant. Sonoma Orchid Inn: Located on a hillside overlooking the Russian River in Guernerville, this fully restore 1906 farmhouse has modern amenities the cows never could have dreamed of. Wi-Fi, hot tub, fireplace, 24 hour kitchen and a breathtaking river view. 5 miles north of Guerneville adjacent to Armstrong Redwoods State natural reserve, the campground offers car camping and back country camping for $15 per person/night. Many hiking trails to choose from. Schoolhouse Canyon Campground 12600 River Rd, Guerneville, Ca 95446 (707) 869-2311 Close to Armstrong Redwoods State Park and the Northwood Golf Course. Paddle on the Russian River or Big Sulphur Creek. 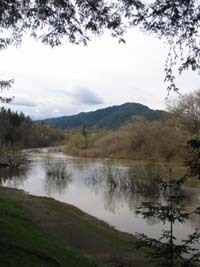 highlights also include Redwood lake and hiking on the Monte Rio Fire Trail. Camp Outback: Mays Canyon Rd off of Route 116 (707) 869-3102 reservations required for tent camping only. Private camp spots. Group camp sites available. Hot showers. Wi-FI. No RV’s. $15 per person/night. Casini Ranch Family Campground 22855 Moscow Rd, Duncans Mills, Ca 95430 (707) 865-2255 Beautiful family campground 4 miles from the Pacific Coast. 110 acres ranch offers group and private camping. Wi-fi available. Full RV hookups. Outdoor movie nights in summer and fall.